EraGem Blog: What is Guilloche? This gorgeous designer ring by De Vroomen highlights the skill of a guilloche master. 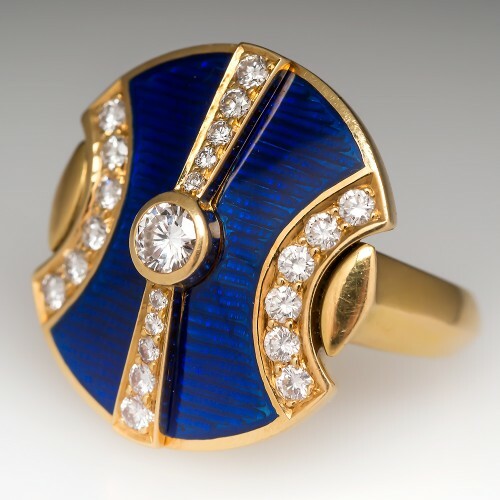 Featuring a geometric design reminiscent of Art Deco, this gorgeous 18k gold cocktail ring was actually made in 1986. Though others have been made since then, the truth is that guilloche is actually a dying art. The machines that are essential to the process are not being made any longer. Only a handful of them are still in operation. New jewelers are not being taught the techniques of using the machines, so when the last of the makers pass on the art of guilloche will die with them. Guilloche as an art form took root in the early 1800s, when Carl Faberge got hold of a rose engine, a machine which turned metal while engraving it, leaving a spirograph-type pattern etched upon the surface of the metal. Faberge was the first to combine this mechanical action with the art of enameling, which is why many mistakenly call it guilloche enamel. Enameling is a completely separate process from guilloche. Guilloche refers only to the manually wrought patterns elicited from the operation of the turning engines. Enameling is the second process, applied to the engraved metal plates. Faberge realized that the grooves and lines etched into the metal encouraged the pooling of enamel, rendering a beautiful effect in molten colored glass. He began incorporating these two processes into his most famous pieces, including the Faberge Eggs. From there, guilloche and enameling became the hottest new trend. That's why today it is common to find so many Victorian jewels with guilloche patterns. The art was nearly lost at the start of World War II, as the use of rose engines and manual engine turning died. However, in the 1970s, Pledge & Aldworth Engine Turners sparked a revival of the art, refurbishing the old machines and teaching the skills to new artisans. Sadly, market demand proved minimal. Therefore, new lathe engines were not created. As the old ones wore down, there were none to replace them. Currently De Vroomen is one of the only modern-day designers with a working machine. While the modern application of guilloche includes jewels, De Vroomen primarily applies the art to their luxury time pieces. One day, even these will cease to include the beauty and artistry of the finely honed skills of a lathe engine turner. Then, guilloche will truly be a collector's privy.